1st Pictures for the Action for Rural Roads Campaign.. 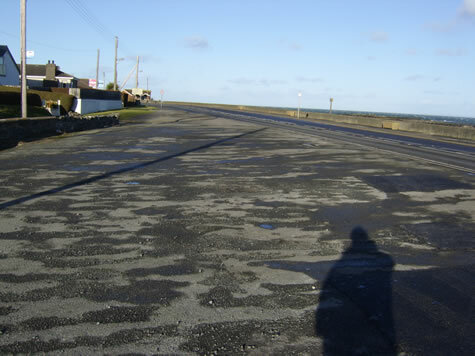 Above from Millisle is an image of a lay-by which is a prime example of the skewed priorities of those departments responsibie for roads maintenance. Apparently this rarely used lay-by took a day to repair, filling in several potholes, while the roads coming into Millisle are broken, potholed, and ignored. One road is actually splitting two, and a picture of that will be on-line shortly. 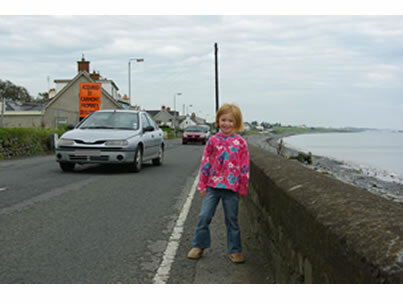 In Ballyhalbert the issue of a lack of footpath for children to safely walk to school is still an issue, with the only current ‘solution’ being a proposal to vest land from elderly residents to create ‘sections’ of path, but this won’t happen for a number of years yet. Also the resurfacing work on high street in the village was never finished leaving high kerbs, raised manholes, and a small lake forming outside the local primary school. This is despite the Roads Services annual report stating work in the area has been successfully completed. Action For Rural Roads Campaign..
We’re ready to receive your submissions for the ‘Action for Rural Roads Campaign’. As we discussed at our last meeting, choose a roads feature in your area that you would like to focus on, then take pictures, or consider doing a video feature at the site with a volunteer explaining the problem (Nick Moore can help with a video camera, tripod, etc, if required) and send them in to either – nmoore@communityofballyhalbert.org.uk or frances@eastdownrcn.com. If you aren’t keen on appearing ‘on screen’ take several photos and write a short explanation about the road issue and we’ll see about narrating the piece in our final video presentation. For any further details don’t hesitate to get in touch, and don’t forget to let your members and anyone else know about this site. Encourage people to visit and use the poll to regiater their opinon on the state of the Peninsula’s roads.